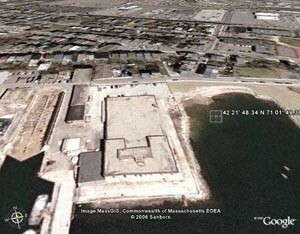 Located in Boston Harbor, before World War II, the East Boston INS facility had been used as temporary housing for foreign seamen. During the war, it was used to incarcerate German, Italian and Japanese detainees awaiting final internment orders for months. Visitation rights were limited and always under guard. (See also: the Max Ebel Story) The facility was modified for to use to hold detainees for extended periods of time. A high fence was erected and a modest exercise area created. Recent visitors have reported speaking with a security guard who recalled talking to detainees through the fence. The facility was abandoned and is deteriorating.